Predictability gets kind of a bad rap. But, in fact, it makes life easy. It's comforting to know what to do and how to do it. It's kind of nice when things are proceeding in an orderly fashion. You become an expert on your routine. If it's Tuesday, it must be time for tacos! And there's nothing wrong with being comfortable, confident and organized. Except that over time, focusing too closely on only the things we are good at — things that are easy and familiar — can actually start to weigh on a person, says Spokane psychologist Laura Asbell. "Challenging ourselves with new endeavors and new learning and new exposures adds to who we are." But being challenged doesn't mean you have to do something rash or even dangerous. Asbell cautions against what she calls the current culture's "over-encouragement of adventure" — the feeling that it is very nearly compulsory to have some incredible feats to post on social media or report to a listener who has just innocently inquired, "How was your weekend?" "There's a cultural expectation that we create adventures, when people have different tastes. But there are benefits to expanding your world, at a pace that fits with who you are." She notes that novel experiences can help us learn to "push through the status quo." It turns out that living life only within our comfort zone serves to reinforce our skill at staying in a comfortable rut — "Look how successful I am at avoiding stress!" And we are drawn to repeating things we are good at. But by regularly avoiding things that carry a risk of discomfort or embarrassment, we can end up less skilled at tackling all sorts of challenges; after all, we never get to practice those coping skills. And that, in turn, leads to more avoidance. "I see that people's circles get smaller," says Asbell. "It's too effortful to go out and do something, and people's lives can get more and more truncated. There's less and less there, over time, and I think they are missing out." Looking for inspiration on how to change things up this fall? Read on to learn about opportunities for trying something new — ways to challenge your mind and body and social skills. It may not be easy. "In the short run, the first step will require effort and maybe a little discomfort," says Asbell. "But there's a long-term benefit that enriches and corrects our expectations, so that we will want to venture out more." 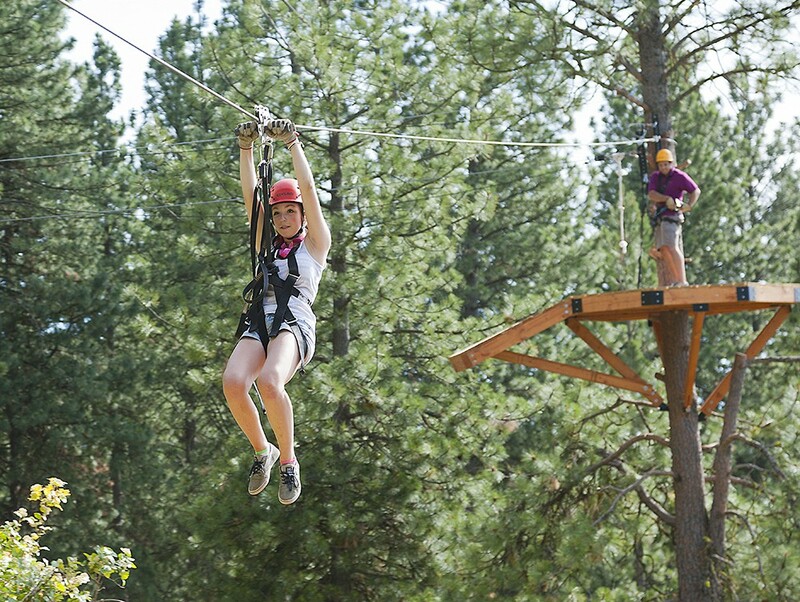 Mallory Johnson zips down the line at Mica Moon Zip Tours near Liberty Lake. Mica Moon Zip Tours founder and owner Rik Stewart sees people get out of their comfort zones every single day he's at work: "That is probably our theme: elevate yourself up out of your comfort zone. When we zip people, they are all there for different reasons." But no matter why people show up to jump off the nine platforms on a trail through the forest canopy on Mica Peak, Stewart says they have one thing in common: "When they get out of the their comfort zone, they open. They flower. It's so much more than adrenaline." 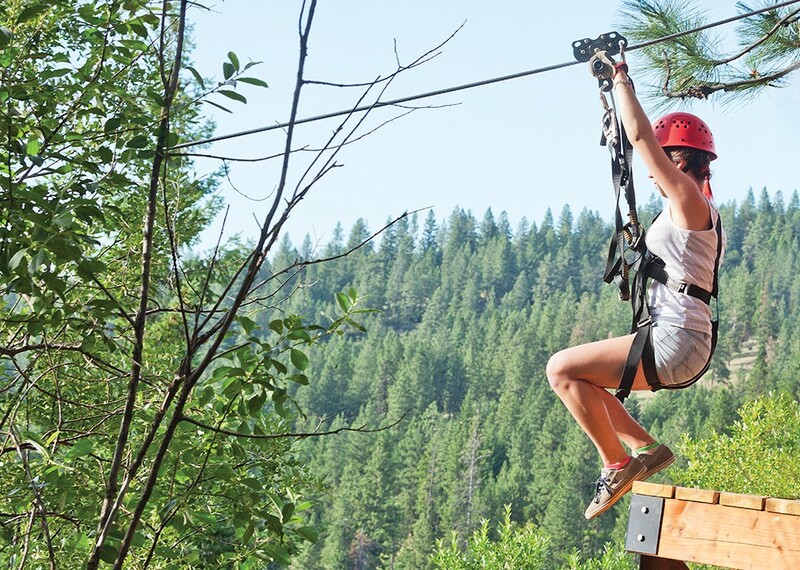 The story of Mica Moon Zip Tours is in itself a study in moving beyond fears. "I had been fighting cancer for 18 years," says Stewart. "And it went crazy. The tumors all came back. I was in the middle of 12 months of chemo in a 15-month period, and I thought this was going to be the end. I decided if I lived, I was going to do the things I want to do." He survived, and "I quit my job and it was the best decision I've ever made." He runs Mica Moon with his wife, Heidi, and doesn't deny that it's a big operation — and a stressful one. But Stewart says his health is better than ever: "I attribute it to the clean air, the one-on-one contact, and the new friends I have made." Zip tours last about three-and-a-half hours and are done in groups of 10 to 12. Some people bring a friend; others may be zipping with people they just met. Regardless, Stewart says there are two ways people seem to work through their nervousness. "Some just talk, talk, talk. And then there are some who are very quiet. But everybody in the tour intuitively encourages the others — even though they just met this person 20 minutes ago, and by the end of the tour they are high-fiving." Tours are open to most everyone, and there are often accommodations that can be made for various levels of ability and age. Stewart recently zipped a couple for their 60th anniversary. There is a weight limit of 275 pounds. Everyone gets weighed, with utmost discretion, Stewart says. "I tell them, 'Here's the scariest part of the event.'" The newest zip line just opened, and at 3,500 feet long, with a 90-second zip, Stewart says it's one of the 10 longest zip lines in the world. It's not unusual to spot wildlife like moose and bear roaming unperturbed as people zip through the trees above them, and visitors also learn a little history of the area's moonshiners and speakeasies during the ride up the mountain. 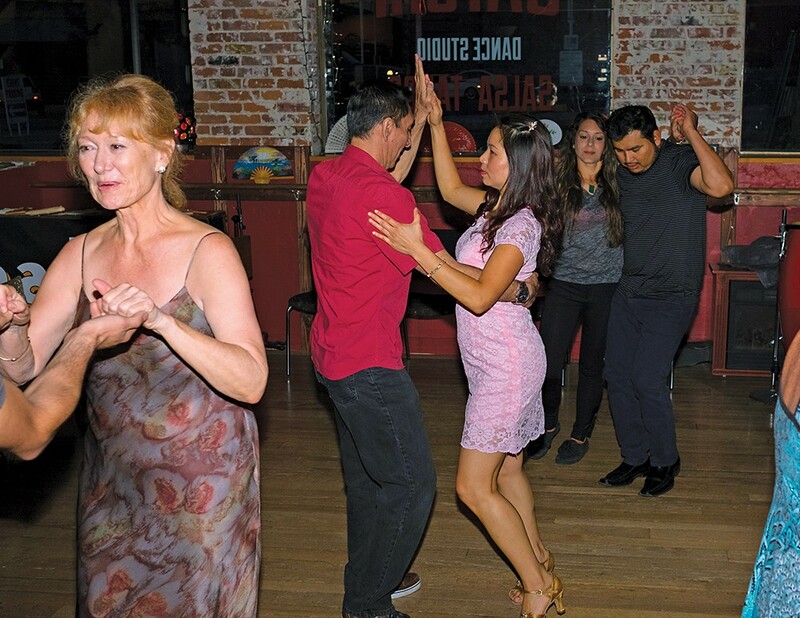 Dancers at Spokane's Satori Dance Studio move to Latin rhythms. You should try dancing! Victor can lead anybody," exclaims Elizabeth Szombathy, an instructor at Spokane's Satori Dance Studio. On a recent visit, and after a generally informative 30-minute interview, things now seem to be headed straight out of my comfort zone. Protests over improper footwear sound hollow, and moments later I find myself standing, with studio owner Victor Smith, preparing to dance. I stare at my feet. "Don't look at your feet. There's nothing down there," he says. Memorizing steps is not what dancing is all about at Satori. Instead, he encourages freeing the mind to focus on the music. "The term they use in Spanish is 'falling asleep to the music.' There's a conversation to be had! You don't have to break it down mathematically," Smith says. "You did a very nice merengue!" Szombathy says as the song ends. She tells her own story of wandering in to Satori Studio out of curiosity after a stressful day at work, just to pick up a flyer, and how she found herself dancing within minutes. An interior designer by day, she now teaches at the studio in the evenings. "The dance is sublime," she says. "Tango is a dance that just kind of transports you into this different realm of just joy. And there's such a nice crowd of people here who you come to be friends with." At Satori, dancers can bring a partner, or not, and choose to dance with others at the class, or just with one person. There's no alcohol, and the goal is to make beginners comfortable. After a language lesson — Spanish or French depending on the evening, because dance is all about communication, says Smith — dancers take the floor. Sometimes there's a live band. Wear whatever shoes you like, although smooth-soled shoes with some sort of heel counter work best. Or try out one of the many different heel heights from the sample shelves at the studio. Some dancers dress up and make it an evening, others don't. After an hour lesson costing just $10, you will be dancing. "You spend the rest of your life getting good at it," says Smith, "but that's like anything." He notes a friend was invited to a get-together and was somewhat sad afterward. "It wasn't a party. No one was dancing." View the schedule at satorispokane.com; for more info call 509-315-7691. 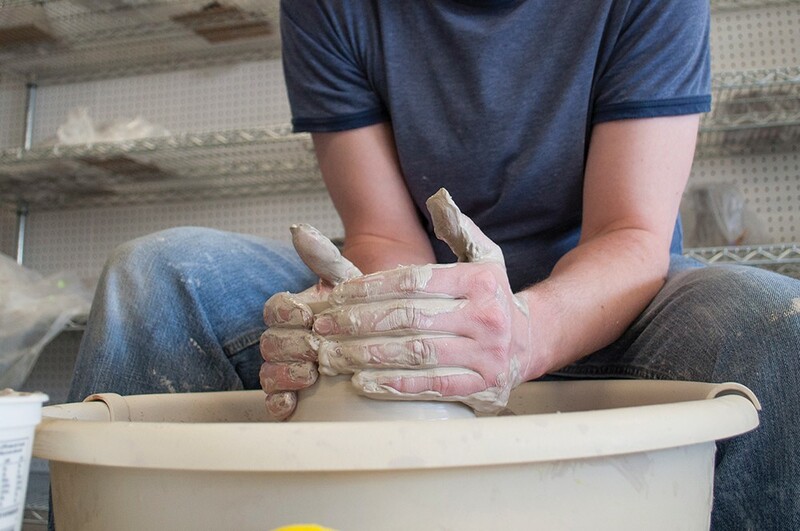 Students at Spokane's Urban Art Co-Op can opt to work on the pottery wheel. Some people are most comfortable when they know exactly what to do, how to do it, and the outcome to expect. They like to be in control. Success is clearly defined, and if something doesn't go as planned, well, that's a failure. If that sounds like you, then getting out of your comfort zone might entail doing something unpredictable and, well, messy. For thousands of years, humans have been unleashing their creativity and individuality to create beautiful and often practical items from clay. Just don't think you're going to be totally in charge of what happens when you get your hands on that inert-looking blob of damp earth. "The clay is going to talk to you," says JoDee Moody, a teacher and resident artist at Spokane's Urban Art Co-op. "It's gonna become what it wants to become. You think you're gonna make one thing, and it turns out to be something totally different." There are two main types of clay work: Hand-building, which entails using slabs and coils of clay that are pressed and pinched together to create all kinds of things, and the more familiar art of throwing pottery on the wheel. People of all ages, from kids and people under 30 to new empty-nesters, are coming to the Co-op to sample both styles in 5- or 8-week class sessions, says Moody. Demand has been strong, and in April the nonprofit moved to a new 3,000-square-foot location on North Monroe — a space nearly twice the size of its previous home. Clay art appeals to people who have worked with it in school when they were younger; some sign up with a friend or family members for something new to do together, or sometimes people sign up after they have "gone through a significant event in their life," says Moody. But regardless of what draws students to working with clay, to creating something with their hands, "what it does is it gives people peace of mind. There's no right and wrong, you can set away all your problems and just have fun." Because basic clay is a relatively inexpensive natural material, there's plenty of room for experimenting. "With clay, it's just clay. If it breaks, you can make another one. It's very freeing. But I tell people, don't get attached to your piece. There's lots of things that can happen," says Moody, who hand-builds all kinds of things from wall art to birdhouses. Glazes can run and mix in ways you might not have imagined, and not every piece survives firing intact. But that's okay. "That's what's so good about clay. You don't have to make it perfect. If you want a perfect mug, go to Walmart and buy one." Fall classes start in September, and after taking one class, the co-op offers memberships for $30 a month. Members get a locker to store their clay in and access to the studio, where resident artists offer tips and inspiration. Sign up for classes at www.urbanartcoop.org or call (509) 327-9000. 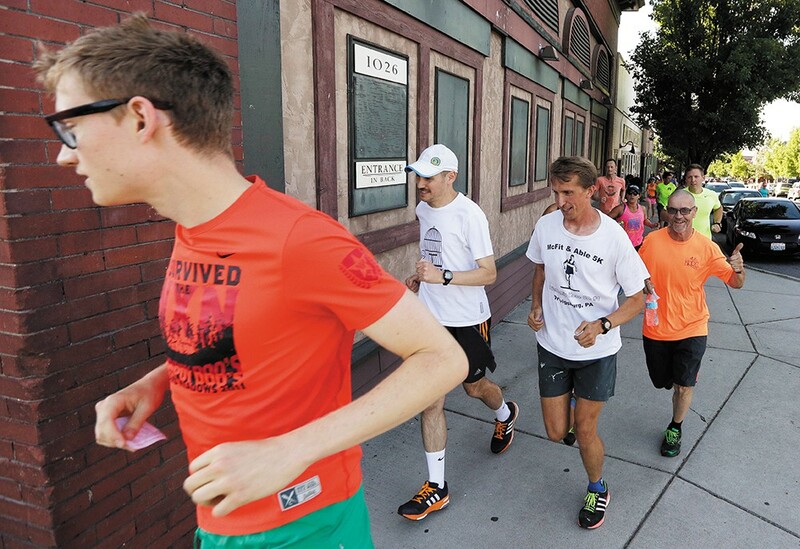 Runners take to the streets in the South Perry District as part of the Lantern Running Club. Face-to-face meetings with strangers can be awkward. Talking to someone next to you, while you're both facing in the same direction, is often a lot more comfortable. It's probably why parents learn that kids tend to say the most interesting, often surprising, things from the back seat of the car while they're are driving them around. But how are adults to achieve that form of easy, no-eye-contact-necessary conversation? Perhaps by striding next to someone. "We started [the Lantern Running Club] when we first purchased the Lantern about five years ago, because we wanted to have something that brought the community together," says Lantern co-owner Melinda Dolmage. "We started with about 15 people in the neighborhood, and now we average about 93." "Running club" may be a bit of a misnomer, however. "The nice thing about it is there is no pressure, it's more just get out and come... We have people who come with strollers, people with baby carriers, people with dogs, people who run, people who walk," says Dolmage. Meet on Tuesdays at 6 pm at The Lantern Taphouse 1004 South Perry.